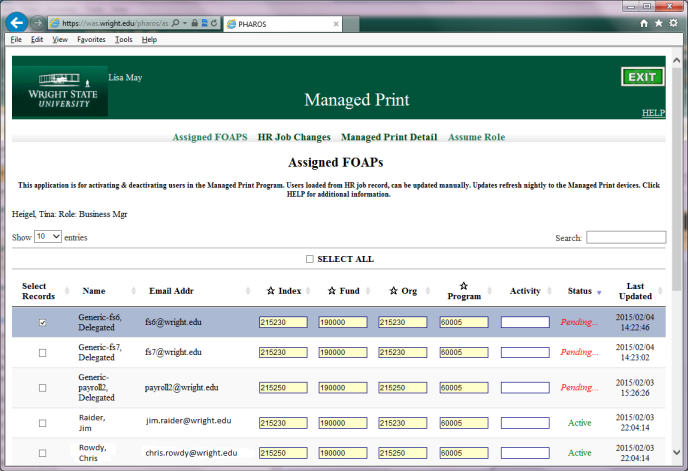 The WSU-created Managed Print link appears for selected users and provides the ability to query/review and edit FOAPAL information for print, copy, and fax services by username. It started in 2015, and includes detailed reports from the Managed Print system, the ability for Business Managers to assign a Proxy, etc. This page displays a list of Managed Print users, originally populated from Human Resource records and editable as needed. Each user has 1 or more FOAPs assigned, to which their Managed Print jobs are charged. Use the arrow keys at the top of the Name, Email Addr, Status or Last Updated column to sort all records. Search/Filter functionality: simply key in an org, part of a name, etc to view only records with that keyed in data. Employees are generally brought in, as "Pending", when their HR record is first created, based on the job labor distribution FOAPAL. The exceptions are employees paid on 6xxxxx funds (sponsored awards) and student employees. A single user may be assigned more than 1 FOAP, in which case they will need to select a FOAP each time they use a device. The defined Index and its title will appear on the device for each FOAPAL for the user to select from. Each device will recall which was the last used FOAP & will sort it to the top of the list. Users who only have 1 defined FOAP won't need to select the FOAP each time they use a device. A record must be Active in order for it to feed to the Managed Print devices. To select a record, click on the box to the left of it. To deselect a record, double-click on the box to the left of it. Fields with a star are required: Index, Fund, Org, Program. Use lower case when inputting a wxxxaaa ID or name. Pause after selecting an Index, and the related Fund, Org, and Program will autopopulate. Pending records may be Deleted, as they have not yet been used in the system. Active records may be inactivated, but not Deleted. Inactive records maintain their history in the Managed Print system. Note that changes made in WINGS Express Finance Managed Print are uploaded nightly so that they are reflected in the devices the next day. Note that Business Managers with many rows to add may use the File Upload tab functionality (explained below) instead of manually keying in each row/record. When the Financial Manager associated with a given organization code is changed in Banner, CaTS has written code to move records for the user/FOAPs selected from the old to the new Financial Manager. Input the delegated account (e.g. acctspay1)in the WID and Name field. Add the Index, Fund, Org, Program, Activity & click Add. If no email address appears for the delegated account, the delegated student account can copy/print. If you wish the delegated student account to be able to fax, please contact Jeff Bowman in CaTS to request an email account. This page is informational only and displays selected changes made by Human Resources for your users. Use the arrow keys at the top of each column to sort all records. This page shows individual print details which make up monthly postings to Finance via the PSxxxxx Journal Voucher feeds. Includes UserName, Cost Center (Index), Total Pages, Color Pages, Amount, Printer, and Date and saves to an Excel file. Export Selected button sends just the rows you have identified (using the Search box) to an html file which can then be saved in Excel. Export All button sends all of the print detail rows to an Excel file. This page allows Business Managers to select another Finance user(s) to act on their behalf in the Managed Print link. Each WCPA/Business Manager may select one or more active Finance users to act as Proxy. 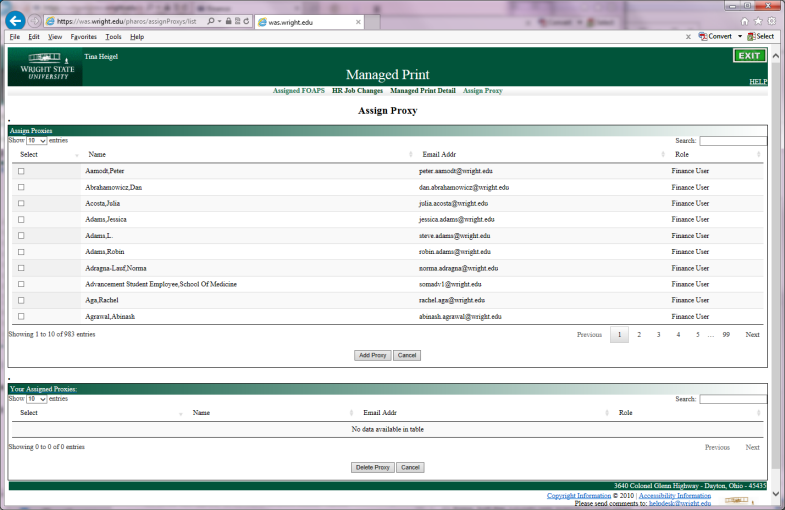 Each Proxy will then see the Managed Print link in WINGS Express Finance (this occurs real-time). The Proxy will assume the role of the Business Manager who assigned them as Proxy and have full rights to assign print FOAPs, view Managed Print detail, etc. A Proxy may not assign a Proxy for themselves. A Business Manager may not assign another Business Manager or a Super User as a Proxy. A Proxy may only act as Proxy for 1 Business Manager. This tab appears for a handful of Super Users who are able to help administer the system. This tab appears for Business Managers (and for SuperUsers who have assumed the role of a Business Manager). This functionality permits the upload of a .csv file with user FOAPAs, instead of manually keying this information into the Assigned FOAPs web page. After you browse to find your .csv file and click "SubmitQuery", you will immediately receive output for each record of your file to indicate if each uploaded file row was successful or the nature of the error if it was unsuccessful. (Common errors are invalid ID or FOAPA information, or the record may already exist). Successfully uploaded rows will appear as "Pending" records in the Assigned FOAPs list for that Business Manager. Managed Print copy charges post once a month via a Journal Voucher having a PS prefix. The Managed Print Detail report above supports the charges posted. For Fiscal Year 2015: Color Copies are $.20 each and Total Copies less Color Copies = Black & White Copies at $.05 each. For Fiscal Year 2016: Color Copies are $.10 each and Total Copies less Color Copies = Black & White Copies at $.04 each.